With my daily routine, my feet always look good. Kim removes any excess hard skin from her feet once a week using Amopé Pedi Perfect™ Electronic Foot File with Diamond Crystals. 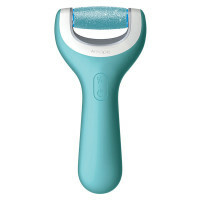 The Micralumina™ roller head gently removes rough patches of skin – all in less than two minutes. In an additional step, Kim applies Amopé Pedi Perfect™ Daily Moisturizer to her feet once a day. This special formula provides the feet with moisture all day long.